Good Wives and Warriors, aka Becky Bolton and Louise Chappell, let out all the stops in this highly imaginative coloring book. 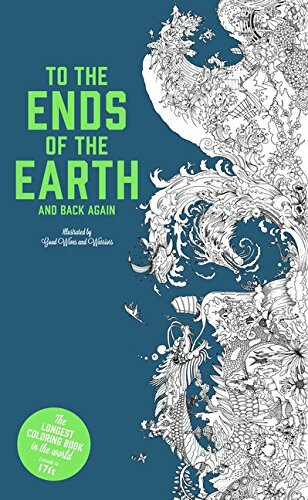 Not just a coloring book, but an adventure story as well, this book is sure to get the brain moving, dreaming, wondering, wandering. The cover opens on once upon a time, in a land far, far away, a little cottage in the woods, an open gate, a map, a compass, the bright dawn of day and a low wooden footbridge leading to who knows what’s next. Spend time filling in the flowers, lingering with the forest critters. But chances are the gaze of the hill dragon and the leap of the otter across the river will tug at those latent desires to travel and the page will get turned without a hint of color. There is a shark fin in the river. Two ghosts peek out of a cave. Fantastical elk, bear, and rabbit lend a lazy eye as they try to decide whether or not to join in the journey or simply let the traveler pass on by. Coming out of the woods there is an amazing array of opportunities. Viking ships, pyramids, totem poles, great walls and mountain fortresses beckon. Intrigue is sharpened by wave after wave of water morphed into creature, or is it creature morphed into water. As the day goes on, the sun moves through the sky, and the sky in turn gets bluer and darker. At mid-day, lunchtime is ready on Easter Island. In the heat of the day the hummingbirds feed while the salamanders sunbathe during their siesta. Toward nightfall, the geese are flying south. The teepees and grass huts prepare for the long winter night. A polar bear sniffs his snout inside arctic igloos where dinner stew must be cooking. The northern lights flash fiercely through the chilly atmosphere. With tired eyes and hearty yawn the day’s journey comes to rest. Woven rugs spread out as a welcome mat leading to a hospitality monster, arms wide open at the threshold of his home as if to announce that there is no better place on earth to rest a weary head. Indeed, the other guests, owl, peacock and dragon included, seem to be preparing to vacate their spaces to commence their nightly hunt, leaving plenty of room for colorists who prefer to hunt during the daylight hours. And back at the beginning again, the exploration starts anew. Who knows what will be encountered. There are no limits only possibilities. Maybe today a trip to Stonehenge. Maybe carillon bells in a Medieval tower. Maybe the tree of life with leaves disguised as lions, tigers, elephants. Grab some pens, and go get lost! Why this journey is laid out 17 feet long for a toddler is really the mystery. A three to five year old with the dexterity, manual coordination, or patience level to color in between these very fine lines would be a rare child. However, the young teen who viewed this spread out across the living room floor exclaimed, “Holy cow, that thing is wicked cool!” That is the person who would relish this project.